Naturally low in fat and cholesterol, NuPlus, is a smart choice for a meal replacement, between meal snack, or anytime. Keeping a balanced diet is essential for health. Our daily food intake, unfortunately, is often unbalanced. Sunrider’s most basic herbal food is formulated with herbal ingredients that serve as a foundation on which to build a healthy diet and to fill in nutritional gaps. 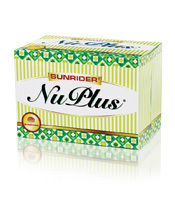 NuPlus® Concentrated Herbal Food blends herbal tradition and nutritional science. It’s a balanced herbal formula based on the Chinese tradition of health maintenance through proper nutrition. Sunrider owner expertise integrates the Philosophy of Regeneration® —to nourish (Yin) and cleanse (Yang) the body—with sound nutritional research. I am 64-years-old and the longest touring motorcycle jumper in the world. 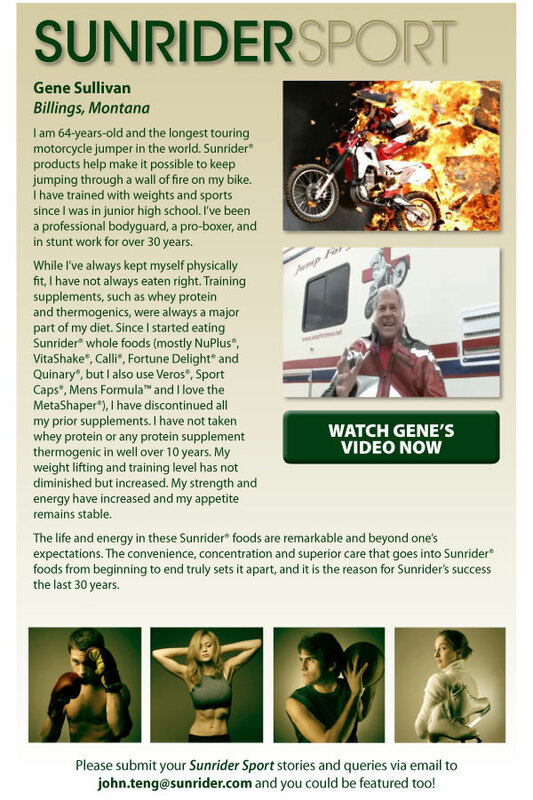 Sunrider products help make it possible to keep jumping through a wall of fire on my bike. I have trained with weights and sports since I was in junior high school. I’ve been a professional bodyguard, a pro-boxer, and in stunt work for over 30 years. While I’ve always kept myself physically fit, I have not always eaten right. Training supplements, such as whey protein and thermogenics, were always a major part of my diets. Since I started eating Sunrider whole foods (mostly Nuplus, Vitashake, Calli, Fortune Delight and Quinary, but also use Veros, Sport Caps, Mens Formula and I love the MetaShaper, I have discontinued all my prior supplements. I have not taken whey protein or any protein supplement thermogenic in well over 10 years. My weight lifting and training level has not diminished but increased. My strength and energy have increased and my appetite remains stable. The life and energy in these Sunrider foods are remarkable and beyond one’s expectations. The convenience, concentration and superior care that goes into Sunrider foods from the beginning to end truly sets it apart, and it is the reason for Sunrider’s success the last 30 years. Be the first to review “Nuplus” Click here to cancel reply.